Physical Kanban boards may cause some inconveniences to modern businesses. Digital Kanban board is the modern solution bringing the most value to your process. What is a Kanban WIP Limit? Why Should You Use It? Is it time to upgrade your physical board to a digital Kanban board? Your team might have been successfully using physical boards based on Kanban for some time now and you've been happy with them. However, the charm of a whiteboard with sticky notes has faded away quickly. Should you switch to a digital board? What are the benefits of the online Kanban board over a physical one? Answers here. When it comes to Kanban, physical boards are a great solution for small teams working in the same office. However, there are some inconveniences that may arise. One of the first things you may notice could be that when a lot of cards are accumulated, they get messy and the board itself will become more difficult to maintain. When the ‘Done’ column needs to be cleaned, cards simply get thrown away and there is no possibility for tracking back in time. This would be problematic for larger projects with many related cards to them that take months to execute. Another drawback emerges when you need to manage remote employees, freelancers or consultants that are involved in the process. Since they are unable to access the board, it may occur that two people are working on the same task without knowing. The time needed to communicate externally and the impossibility to apply WIP limits would harm the whole Kanban process. On the other hand, using an online Kanban board lets you apply WIP limits per column, swimlane and even per user. Analyzing workflow indicators on a physical board is a difficult task. Cycle times can’t be easily compared with previous periods and this would affect the idea of continuous improvement. If you are not writing down results consistently, it would become impossible to track each person’s personal cycle time. 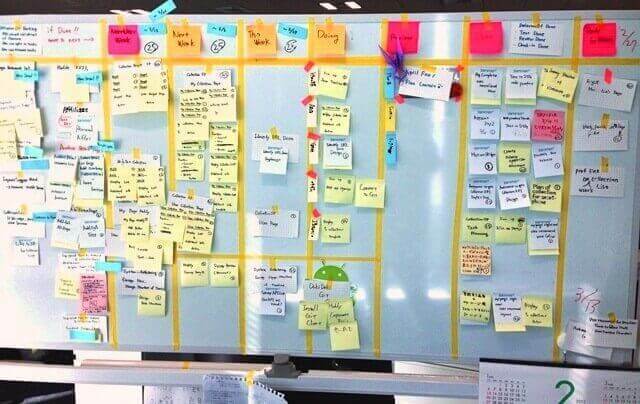 As a result, sooner or later, many teams discover the need for an electronic Kanban board. Some make it an Excel file, so they could manage data more easily. Even though it is a slightly more convenient solution than a physical board, there is a better way. Recognizing the need of more than a physical board does not tell the whole story about the Kanban software. They could really help you apply the method in a whole new way, and even develop it. Kanban thrives in the digital world. The greatest benefit of using an online Kanban board is that all the information is stored on the same board. This is impossible to achieve with a physical one. Every description of a card or attached files will be stored and available to retrieve at any given moment without flooding the space. If a card is created, moved or completed, each action happens live on everyone’s boards without delays or someone having to synchronize anything. All the information for the different tasks is one click away and there is no need of status reporting, which helps you reduce wasteful meetings. Online Kanban boards can be accessed easily from any device with individual login credentials. This allows for tracking urgent situations even outside the physical office and synchronization of the team. Physical boards create opportunities for cards to get lost. Moreover, if a team is working on a project containing sensitive data or confidential information, a physical board could not provide the adequate level of secrecy. On the contrary, Kanban online boards may have an option for a role-based access and each user could have specific rights and restrictions on the board. Most online solutions also have additional single sign-on and two-factor authentication to guarantee security even on an enterprise level. Digital Kanban boards allow a sophisticated analysis of the work process. There are some key metrics to track, which are invisible on a physical board. One of the most useful is the cumulative flow diagram, which allows you to track the stability of your process. 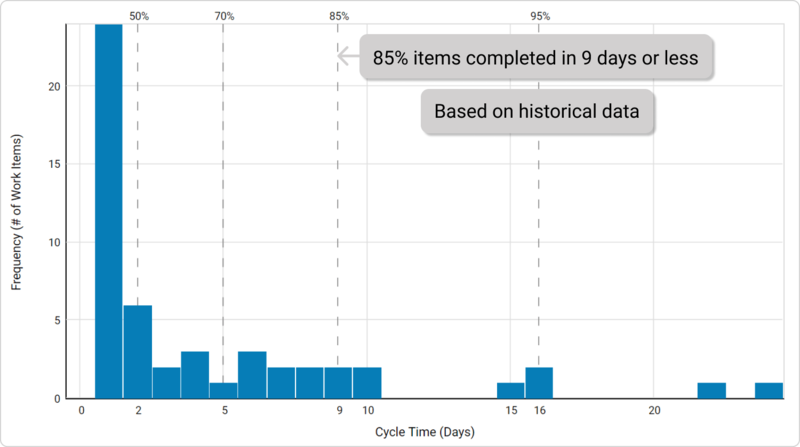 A cycle time scatter plot and histograms will help you to effectively measure cycle times. If you are interested in digging deeper into analytics, the predictive Monte Carlo simulations can even estimate when or how many work items your team will be able to deliver. Another valuable advantage of online Kanban platforms is that they are easy to integrate with other existing systems that are being used. They can be integrated with email so tasks could appear directly on the board instead of having to create them manually. Consolidation with CRMs, and other software tools can also save you a lot of time. The possibility to automate processes is definitely worth exploring. A policy configured as if-this-then-that dependency can give you the freedom to choose the most useful combinations for you. You can trigger reminders, make cards switch columns when a deadline approaches or when an email is received, block card if a subtask is not finished, and much more. You can explore automation combinations in Kanbanize and estimate which would be useful to translate to your process. If your team has encountered some of the issues with a physical Kanban board, you now have a reason to switch to a digital Kanban board. Try it. You won’t regret. Get better accessibility, integrate with various tools and automate recurring tasks.